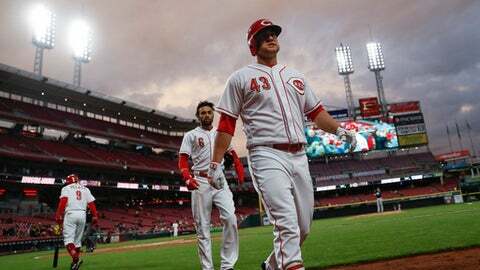 Jesse Winker’s bases-loaded single provided Cincinnati’s first lead in six games, and the Reds – off to the worst start in their history – rallied for their first victory under interim manager Jim Riggleman on Monday night, 10-4 over the Atlanta Braves. The smallest crowd at Great American Ball Park in nine years – 9,463 – saw the Reds get only their second win at home and match their season high in runs. Sal Romano (1-2) allowed four hits in six innings, including Nick Markakis‘ homer. Markakis added a two-run single in the eighth, but Iglesias got the last four outs for his third save. Mike Foltynewicz allowed three hits in 4 2/3 innings, including Scott Schebler’s homer that tied it at 2 in the fifth. The two-run shot snapped Cincinnati’s streak of six games without a homer. The Reds have only 12 homers this season – fewest in the majors – despite playing in one of its most homer-friendly ballparks. Romano made a barehand grab of Ozzie Albies‘ comeback grounder in the sixth and threw him out. He stayed in after a visit from the trainer.